Filipino cuisine (Filipino: Lutuing Filipino or Pagkaing Filipino) is composed of the cuisines of 135 distinct ethno-linguistic tribes found within the Philippine archipelago, however, majority of mainstream Filipino dishes that compose Filipino cuisine are from the cuisines of the Bikol, Chabakano, Hiligaynon, Ilokano, Kapampangan, Meranaw, Pangasinan, Sebwano (or Bisaya), Tagalog, and Waray ethno-linguistic tribes. The style of cooking and the food associated with it have evolved over many centuries from their Austronesian origins (shared with Malaysian and Indonesian cuisines) to a mixed cuisine of Indian, Chinese, Spanish, and American influences, in line with the major waves of influence that had enriched the cultures of the archipelago, as well as others adapted to indigenous ingredients and the local palate. Dishes range from the very simple, like a meal of fried salted fish and rice, to the complex paellas and cocidos created for fiestas of Spanish origin. Popular dishes include: lechón (whole roasted pig), longganisa (Philippine sausage), tapa (cured beef), torta (omelette), adobo (chicken or pork braised in garlic, vinegar, oil and soy sauce, or cooked until dry), kaldereta (meat in tomato sauce stew), mechado (larded beef in soy and tomato sauce), puchero (beef in bananas and tomato sauce), afritada (chicken or pork simmered in tomato sauce with vegetables), kare-kare (oxtail and vegetables cooked in peanut sauce), pinakbet (kabocha squash, eggplant, beans, okra, and tomato stew flavored with shrimp paste), crispy pata (deep-fried pig's leg), hamonado (pork sweetened in pineapple sauce), sinigang (meat or seafood in sour broth), pancit (noodles), and lumpia (fresh or fried spring rolls). During the pre-Hispanic era in the Philippines, the preferred Austronesian methods for food preparation were boiling, steaming and roasting. The ingredients for common dishes were obtained from locally raised livestock. These ranged from kalabaw (water buffaloes/carabaos), baka (cows), manok (chickens) and baboy (pigs) to various kinds of fish and seafood. 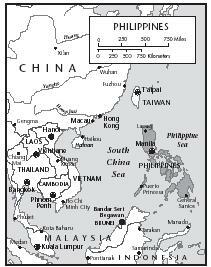 In 3200 BCE, Austronesians from the southern China (Yunnan-Guizhou Plateau) and Taiwan settled in the region that is now called the Philippines. They brought with them knowledge of rice cultivation and other farming practices which increased the number and variety of edible dish ingredients available for cooking. Direct trade and cultural exchange with Hokkien China in the Philippines in the Song dynasty (960–1279 AD) with porcelain, ceramics, and silk being traded for spices and trepang in Luzon. 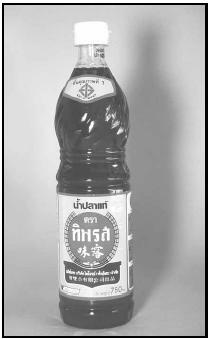 This early cultural contact with China introduced a number of staple food into Philippine cuisine, most notably toyo (soy sauce; Chinese: 豆油; Pe̍h-ōe-jī: tāu-yu), tokwa; (tofu; Chinese: 豆干; Pe̍h-ōe-jī: tāu-koaⁿ), toge (bean sprout; Chinese: 豆芽; Pe̍h-ōe-jī: tāu-koaⁿ), and patis (fish sauce), as well as the method of stir frying and making savory soup bases. Many of these food items and dishes retained their original Hokkien names, such as pancit (Chinese: 便ê食; Pe̍h-ōe-jī: piān-ê-si̍t)(Chinese: 扁食; pinyin: biǎn shí), and lumpia (Chinese: 潤餅; Pe̍h-ōe-jī: jūn-piáⁿ, lūn-piáⁿ). The Chinese food introduced during this period were food of the workers and traders, which became a staple of the noodle shops (panciterias), and can be seen in dishes like arroz caldo (congee), sinangag (fried rice), chopsuey. Trade with the various neighboring kingdoms of Malacca and Srivijaya in Malaya and Java brought with it foods and cooking methods which are still commonly used in the Philippines today, such as Bagoong (Malay: Belacan), Patis, Puso (Malay: Ketupat), Rendang, Kare-kare and the infusion of coconut milk in condiments, such as laing and Ginataang Manok (chicken stewed in coconut milk). 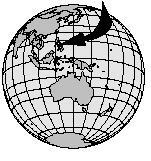 Through the trade with the Malay-Indonesian kingdoms, cuisine from as far away as India and Arabia enriched the palettes of the local Austronesians (particularly in the areas of southern Luzon, Mindanao, Sulu, Palawan, the Visayas and Bicol, where trade was strongest). 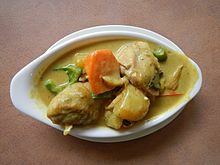 These foods include various dishes eaten in areas of the southern part of the archipelago today, such as kurmah, satti, and biryani, as well as puto, which specifically derives from Indian cuisineputtu. Spanish colonizers and friars in the 16th century brought with them produce from the Americas like chili peppers, tomatoes, corn, potatoes, and the method of sautéing with garlic and onions. 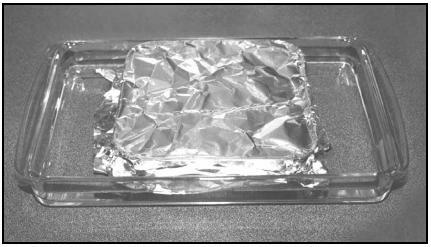 Chili leaves are frequently used as a cooking green. 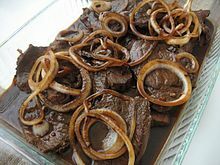 Spanish (and Mexican) dishes were eventually incorporated into Philippine cuisine with the more complex dishes usually being prepared for special occasions. Some dishes such as arroz a la valenciana remain largely the same in the Philippine context. Some have been adapted or have come to take on a slightly or significantly different meaning. Arroz a la cubana served in the Philippines usually includes ground beef picadillo. Philippine longganisa despite its name is more akin to chorizo than Spanish longaniza (in Visayan regions, it is still known as chorizo). Morcon is likely to refer to a beef roulade dish not the bulbous specialty Spanish sausage. Today, Philippine cuisine continues to evolve as new techniques, styles of cooking, and ingredients find their way into the country. Traditional dishes both simple and elaborate, indigenous and foreign-influenced, are seen as are more current popular international viands and fast food fare. However, the Filipino diet is higher in total fat, saturated fat, and cholesterol than other Asian diets. Filipino cuisine centres around the combination of sweet (tamis), sour (asim), and salty (alat), although in Bicol, the Cordilleras and among Muslim Filipinos, spicy (anghang) is a base of cooking flavor. Cooking and eating in the Philippines has traditionally been an informal and communal affair centered around the family kitchen. Filipinos traditionally eat three main meals a day: agahan or almusal (breakfast), tanghalían (lunch), and hapunan (dinner) plus an afternoon snack called meriénda (also called minandál or minindál). Snacking is normal. Dinner, while still the main meal, is smaller than other countries. Usually, either breakfast or lunch is the largest meal. Food tends to be served all at once and not in courses. Unlike many of their Asian counterparts Filipinos do not eat with chopsticks. Due to Western influence, food is often eaten using flatware—forks, knives, spoons—but the primary pairing of utensils used at a Filipino dining table is that of spoon and fork, not knife and fork. The traditional way of eating is with the hands, especially dry dishes such as inihaw or prito. The diner will take a bite of the main dish, then eat rice pressed together with his fingers. This practice, known as kamayan, is rarely seen in urbanized areas. However, Filipinos tend to feel the spirit of kamayan when eating amidst nature during out-of-town trips, beach vacations, and town fiestas. As in most Asian countries, the staple food in the Philippines is rice. It is most often steamed and always served with meat, fish and vegetable dishes. Leftover rice is often fried with garlic to make sinangag, which is usually served at breakfast together with a fried egg and cured meat or sausages. Rice is often enjoyed with the sauce or broth from the main dishes. In some regions, rice is mixed with salt, condensed milk, cocoa, or coffee. 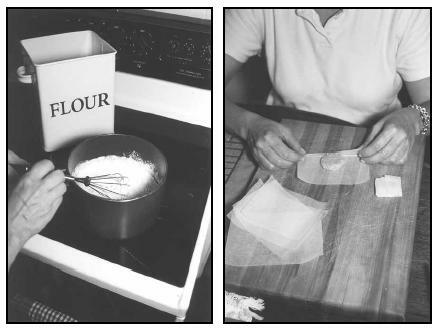 Rice flour is used in making sweets, cakes and other pastries. Sticky rice with cocoa, also called champorado is also a common dish served with tuyo or dried herring. A variety of fruits and vegetables is often used in cooking. Bananas (the saba variety in particular), kalamansi, guavas (bayabas), mangoes, papayas, and pineapples lend a distinctly tropical flair in many dishes, but mainstay green leafy vegetables like water spinach (kangkong), Chinese cabbage (petsay), Napa cabbage (petsay wombok), cabbage (repolyo) and other vegetables like eggplants (talong) and yard-long beans (sitaw) are just as commonly used. Coconuts are ubiquitous. 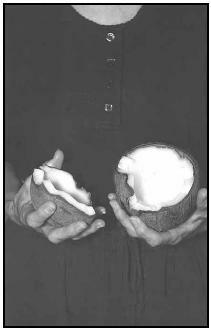 Coconut meat is often used in desserts, coconut milk (kakang gata) in sauces, and coconut oil for frying. Abundant harvests of root crops like potatoes, carrots, taro (gabi), cassava (kamoteng kahoy), purple yam (ube), and sweet potato (kamote) make them readily available. The combination of tomatoes (kamatis), garlic (bawang), and onions (sibuyas) is found in many dishes. Meat staples include chicken, pork, beef, and fish. Seafood is popular as a result of the bodies of water surrounding the archipelago. Popular catches include tilapia, catfish (hito), milkfish (bangus), grouper (lapu-lapu), shrimp (hipon), prawns (sugpo), mackerel (galunggong, hasa-hasa), swordfish (isdang-ispada), oysters (talaba), mussels (tahong), clams (halaan and tulya), large and small crabs (alimango and alimasag respectively), game fish, sablefish, tuna, cod (bakalaw), blue marlin, and squid/cuttlefish (both called pusit). Also popular are seaweeds (damong dagat), abalone, and eel (igat). or wood (inihaw). Other preparations include escabeche (sweet and sour), relleno (deboned and stuffed), or "kinilaw" (similar to ceviche; marinated in vinegar or kalamansi). Fish can be preserved by being smoked (tinapa) or sun-dried (tuyo or daing). Food is often served with various dipping sauces. Fried food is often dipped in vinegar, soy sauce, juice squeezed from Kalamansi (Philippine lime or calamansi), or a combination of two or all. Patis (fish sauce) may be mixed with kalamansi as dipping sauce for most seafood. Fish sauce, fish paste (bagoong), shrimp paste (bagoong alamang) and crushed ginger root (luya) are condiments that are often added to dishes during the cooking process or when served. A traditional Filipino breakfast might include pandesal (small bread rolls), kesong puti (fresh, unripened, white Filipino cheese, traditionally made from carabao's milk) champorado (chocolate rice porridge), sinangag (garlic fried rice), and meat—such as tapa, longganisa, tocino, karne norte (corned beef), or fish such as daing na bangus (salted and dried milkfish)—or itlog na pula (salted duck eggs). Coffee is also commonly served particularly kapeng barako, a variety of coffee produced in the mountains of Batangas noted for having a strong flavor. Certain portmanteaus in Filipino have come into use to describe popular combinations of items in a Filipino breakfast. An example of such a combination order is kankamtuy: an order of kanin (rice), kamatis (tomatoes) and tuyo (dried fish). Another is tapsi: an order of tapa and sinangág. Other examples include variations using a silog suffix, usually some kind of meat served with sinangág and itlog (egg). The three most commonly seen silogs are tapsilog (having tapa as the meat portion), tocilog (having tocino as the meat portion), and longsilog (having longganisa as the meat portion). Other silogs include hotsilog (with a hot dog), bangsilog (with bangus (milkfish)), dangsilog (with danggit (rabbitfish)), spamsilog (with spam), adosilog (with adobo), chosilog (with chorizo), chiksilog (with chicken), cornsilog (with corned beef), and litsilog (with lechon/litson). Pankaplog is a slang term referring to a breakfast consisting of pandesal, kape (coffee), and itlog (egg). An establishment that specializes in such meals is called a tapsihan or tapsilugan. Filipinos have a number of options to take with kapé, which is the Filipino pronunciation of café (coffee): breads and pastries like pandesal, ensaymada (buttery brioche covered in grated cheese and sugar), hopia (pastries similar to mooncakes filled with mung bean paste) and empanada (savoury, meat-filled pasties). Also popular are kakanín, or traditional pastries made from sticky rice like kutsinta, sapin-sapin (multicoloured, layered pastry), palitaw, biko, suman, Bibingka, and pitsi-pitsî (served with desiccated coconut). Savoury dishes often eaten during merienda include pancit canton (stir-fried noodles), palabok (rice noodles with a shrimp-based sauce), tokwa't baboy (fried tofu with boiled pork ears in a garlic-flavoured soy sauce and vinegar dressing), and dinuguan (a spicy stew made of pork blood), which is often served with puto (steamed rice flour cakes). Dim sum and dumplings, brought to the islands by Fujianese migrants, have been given a Filipino touch and are also popular merienda fare. Street food, such as squid balls and fish balls, are often skewered on bamboo sticks and consumed with soy sauce and the sour juice of the calamondin as condiments. Pulutan (from the Filipino word pulutin which literally means "to pick something up") is a term roughly analogous to the English term "finger food" or Spanish Tapas. Originally, it was a snack accompanied with liquor or beer but has found its way into Philippine cuisine as appetizers or, in some cases, main dishes, as in the case of sisig. Deep fried pulutan include chicharrón (also spelled chicharon or tsitsaron), pork rinds that have been boiled and then twice fried, the second frying gives the crunchiness and golden color; chicharong bituka, pig intestines that have been deep fried to a crisp; chicharong bulaklak, similar to chicharong bituka it is made from mesenteries of pig intestines and has an appearance roughly resembling a flower, hence the bulaklak name; and chicharong manok, chicken skin that has been deep fried until crisp. Examples of grilled foods include: isaw, or chicken or pig intestines skewered and then grilled; Inihaw na tenga, pig ears that have been skewered and then grilled; pork barbecue, skewered pork marinated in a sweet soy-garlic blend and then grilled; betamax, salted solidified pork or chicken blood which is then skewered and lightly grilled; adidas which is grilled or sautéed chicken feet. There is also sisig, a popular pulutan made from the pig's cheek skin, ears and liver that is initially boiled, then charcoal grilled and afterwards minced and cooked with chopped onions, chillies, and spices. Smaller snacks such as mani (peanuts) are often sold steamed in the shell, salted, spiced or flavored with garlic by street vendors in the Philippines. Another snack is kropeck, which is fish crackers. Tokwa't baboy is fried tofu with boiled pork marinated in a garlic-flavored soy sauce or vinegar dip. It is also served as a side dish to pancit luglog or pancit palabok. You can also find tuhog-tuhog accompanied by sweet or spicy sauce. This include Fish balls, Kikiam, Squid balls etc., these are commonly served during a small gathering or in local bars. In a typical Filipino bakery, pandesal, monay and ensaymada are often sold. Pandesal comes from the Spanish pan de sal (literally, bread of salt), and is a ubiquitous breakfast fare, normally eaten with (and sometimes even dipped in) coffee. It typically takes the form of a bread roll, and is usually baked covered in bread crumbs. Contrary to what its name implies, pandesal is not particularly salty as very little salt is used in baking it. Monay is a firmer slightly denser heavier bread. Ensaymada, from the Spanish ensaimada, is a pastry made using butter and often topped with sugar and shredded cheese that is especially popular during Christmas. 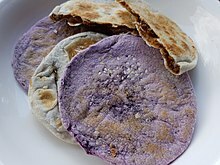 It is sometimes made with fillings such as ube (purple yam) and macapuno (a variety of coconut the meat of which is often cut into strings, sweetened, preserved, and served in desserts). 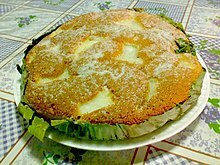 Also commonly sold in Filipino bakeries is pan de coco, a sweet roll filled with shredded coconut mixed with molasses. Putok, which literally means "explode", refers to a small, hard bread roll whose cratered surface is glazed with sugar. Kababayan is a small, sweet gong-shaped muffin that has a moist consistency. Spanish bread refers to a rolled pastry which looks like a croissant prior to being given a crescent shape, and has a filling consisting of sugar and butter. custard made with eggs and milk similar to the French creme caramel. Leche flan (the local term for the original Spanish flan de leche, literally "milk flan") is a heavier version of the Spanish flan made with condensed milk and more egg yolks. Leche flan is usually steamed over an open flame or stove top, although on rare occasions it can also be seen baked. Leche flan is a staple in celebratory feasts. Stuffed pastries that reflect both Western and Eastern influence are common. One can find empanadas, a turnover-type pastry filled with a savory-sweet meat filling. Typically filled with ground meat and raisins, it can be deep fried or baked. Siopao is the local version of Chinese baozi. Buchi is another snack that is likely of Chinese origin. 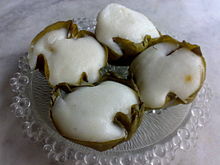 Bite-sized, buchi is made of deep-fried dough balls (often from rice flour) filled with a sweet mung bean paste, and coated on the outside with sesame seeds; some variants also have ube as the filling. There are also many varieties of the mooncake-like hopia, which come in different shapes (from a flat, circular stuffed form, to cubes), and have different textures (predominantly using flaky pastry, but sometimes like the ones in mooncakes) and fillings. For festive occasions, people band together and prepare more sophisticated dishes. Tables are often laden with expensive and labor-intensive treats requiring hours of preparation. In Filipino celebrations, lechón (also spelled litson) serves as the centerpiece of the dinner table. It is usually a whole roasted pig, but suckling pigs (lechonillo, or lechon de leche) or cattle calves (lechong baka) can also be prepared in place of the popular adult pig. 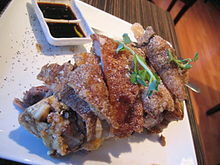 It is typically served with lechon sauce, which is traditionally made from the roasted pig's liver. Other dishes include hamonado (honey-cured beef, pork or chicken), relleno (stuffed chicken or milkfish), mechado, afritada, caldereta, puchero, paella, menudo, morcon, embutido (referring to a meatloaf dish, not a sausage as understood elsewhere), suman (a savory rice and coconut milk concoction steamed in leaves such as banana), and pancit canton. The table may also be have various sweets and pastries such as leche flan, ube, sapin-sapin, sorbetes (ice creams), totong (a rice, coconut milk and mongo bean pudding), ginataan (a coconut milk pudding with various root vegetables and tapioca pearls), and gulaman (an agarjello-like ingredient or dessert). More common at celebrations than in everyday home meals, lumpiang sariwa, or fresh lumpia, is a fresh spring roll that consists of a soft crepe wrapped around a filling that can include strips of kamote (sweet potato), singkamas (jicama), bean sprouts, green beans, cabbage, carrots and meat (often pork). It can be served warm or cold and typically with a sweet peanut and garlic sauce. Ukoy is shredded papaya combined with small shrimp (and occasionally bean sprouts) and fried to make shrimp patties. It is often eaten with vinegar seasoned with garlic, salt and pepper. Both lumpiang sariwa and ukoy are often served together in Filipino parties. Lumpiang sariwa has Chinese origins, having been derived from popiah. The Igorot prefer roasted meats, particularly carabao meat, goat meat, and venison. Isabela is known for Pancit Cabagan of Cabagan, Inatata & Binallay of Ilagan City are rice cakes prepared year-round in the city and both famous delicacies specially during the lenten season. 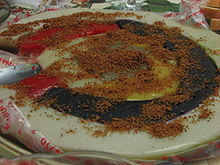 Cagayan for its famous Carabao Milk Candy in the town Alcala and Tuguegarao City for Pancit Batil Patung and Buko Roll. Kapampangan cuisine makes use of all the produce in the region available to the native cook. Among the treats produced in Pampanga are longganisa (original sweet and spicy sausages), calderetang kambing (savory goat stew), and tocino (sweetened cured pork). Combining pork cheeks and offal, Kapampangans make sisig. The cuisine of the Tagalog people varies by province. Bulacan is popular for chicharon (pork rinds) and steamed rice and tuber cakes like puto. It is a center for panghimagas or desserts, like brown rice cake or kutsinta, sapin-sapin, suman, cassava cake, halaya ube and the king of sweets, in San Miguel, Bulacan, the famous carabao milk candypastillas de leche, with its pabalat wrapper.Cainta, in Rizal province east of Manila, is known for its Filipino rice cakes and puddings. These are usually topped with latik, a mixture of coconut milk and brown sugar, reduced to a dry crumbly texture. A more modern, and time saving alternative to latik are coconut flakes toasted in a frying pan. Antipolo City, straddled mid-level in the mountainous regions of the Philippine Sierra Madre, is a town known for its suman and cashew products. Laguna is known for buko pie (coconut pie) and panutsa (peanut brittle). Batangas is home to Taal Lake, a body of water that surrounds Taal Volcano. The lake is home to 75 species of freshwater fish. Among these, the maliputo and tawilis are two not commonly found elsewhere. These fish are delicious native delicacies. Batangas is also known for its special coffee, kapeng barako. Bacolod City is the capital of Negros Occidental. There are a plethora of restaurants in Bacolod that serve delicious local dishes which visitors shouldn’t miss when they travel in the city. It is known for "inasal" which literally translates to “cooked over fire”. The "chicken inasal" is a local version of chicken barbecue. It is cooked with red achuete or annatto seeds giving it a reddish color, and brushed with oil and cooked over the fire. The city is also famous for various delicacies such as piaya, napoleones and pinasugbo (hard candied banana sprinkled with sesame seeds). Aklan is synonymous with Inubarang Manok, chicken simmered in coconut milk, as well as Binakoe na Manok, chicken cooked in bamboo with lemongrass. Of particular interest is Tamilok (wood worms), which is either eaten raw or dipped in an acidic sauce such as vinegar or calamansi. 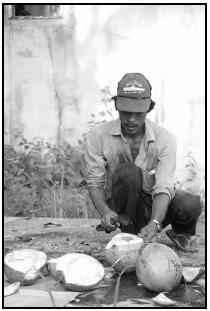 There is a special prevalence of chicken and coconut milk (gata) in Akeanon cooking. Iloilo is home of the Batchoy, derived from “Ba-chui” meaning pieces of meat in Chinese. The authentic Batchoy contains fresh egg noodles called miki, buto-buto broth slow-cooked for hours, and beef, pork and bulalo mixed with the local guinamos (shrimp paste). Toppings include generous amounts of fried garlic, crushed chicharon, scallions, slices of pork intestines and liver. Another type of pancit which is found in the said province is Pancit molo, an adaptation of wonton soup and is a specialty of the town of Molo, a well-known district in Iloilo. Unlike other pancit, Pancit molo is not dry but soupy and it does not make use of long, thin noodles but instead wonton wrappers made from rice flour. Iloilo, is also famous for its two kadios or pigeon pea-based soups. The first is KBL or "Kadios Baboy Langka". 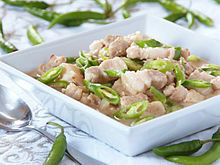 As the name implies, the three main ingredients of this dish are kadyos, baboy (pork), and langka (unripe jackfruit is used here). Another one is KMU or "Kadios Manok Ubad". This dish is composed mainly of kadyos, manok (preferably free range chicken called Bisaya nga Manok in Iloilo), and ubad(thinly cut white core of the banana stalk/trunk). Both of these dishes utilize another Ilonggo ingredient as a souring agent. This ingredient is batwan or Garcinia binucao, a fruit closely related to mangosteen, which is very popular in Western Visayas but is generally unknown to other parts of the Philippines. Roxas City is another food destination in Western Visayas aside from Iloilo City and Kalibo. This coastal city that's about two to three hours by bus from Iloilo City prides itself as the Seafood Capital of the Philippines due to its bountiful rivers, estuaries and seas. Numerous seafood dishes are served in the city's Baybay area from mussels, oysters, scallops, prawns, seaweeds, clams, fishes and many more. In Bohol, kalamay is popular. In Palawan, crocodile meat is boiled, cured, and turned into tocinos. In Romblon, a speacialty dish is pounded and flavored shrimp meat and rice cooked inside a banana life. In Mindanao, the southern part of Palawan island, Sulu and Tawi-Tawi, dishes are richly flavored with the spices common to Southeast Asia: turmeric, coriander, lemon grass, cumin, and chillies — ingredients not commonly used in the rest of Filipino cooking. Being free from European colonization, the cuisine of the indigenous Moro and Lumad peoples of Mindanao and the Sulu archipelago has much in common with the rich and spicy Malay cuisine of Malaysia and Brunei, as well as Indonesian and Thai cuisine. Well-known dishes from the region include Satti (satay) and ginataang manok (chicken cooked in spiced coconut milk). Certain parts of Mindanao are predominantly Muslim, where pork is rarely consumed. Rendang, is an often spicy beef curry whose origins derive from the Minangkabau people of Sumatra; biryani and kiyoning (pilaf) are dishes originally from the Middle East, that were given a Mindanaoan touch and served on special occasions. Pyanggang is a Tausug dish made from barbecued chicken marinaded in spices, and served with coconut milk infused with toasted coconut meat. Sambal, a spicy sauce made with belacan, tamarind, aromatic spices and chillies, is a popular base of many dishes in the region. Lamaw (Buko salad), is a mixture of young coconut, its juice, milk or orange juice, with ice. Piaya, one of the most popular delicacies of Bacolod.